Coming off a extremely successful campaign the previous year, the 1948 Buffalo Bulls football team surprisingly started the season with a new coach. 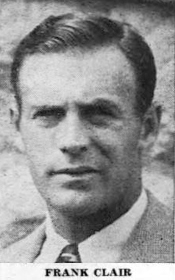 Jim Peelle, serving as the head coach of the Buffalo football program since 1936, coach was ready to vacate the position and focus his attention strictly on his Athletic Director duties by the summer of 1948. A lot was expected from Frank Clair and his 1948 squad. Clair hoped about 70 candidates would be on hand when the training season got under way. When training camp finally arrived, he installed a new T-formation offense. “Our quarterbacks will carry an extra burden into the game; the T-formation is new to them, and you don’t pick up the fakes and the ball-handling required of the T in a few weeks. I am very pleased with the way that Jules Licata is developing. He may be an outstanding passer.” But due to school requirements, several of his players we unable to attend the first 2 weeks of practice. Even before the season started, Clair warned that the Bulls may not reach their peak until midway through the season. Clair’s prediction proved correct. Buffalo was completely outclassed in their season opener against Colgate, a team they hadn’t played since 1898. Buffalo completed only 1 of 6 passes before eventually discarding the aerial attack altogether. They lost 25-0 to the Red Raiders. Fortunately, the Colgate debacle proved to be an aberration and Buffalo’s only lose of the season. U.B. routed Hobart the next week in Buffalo’s home-opener and went on a 5 game winning streak. The signature win of the season came in week 6. The Bulls crushed the University of Louisville 48-13 in Louisville, KY. Louisville was simply no match for the Buffalo Bulls. In deep contrast to the Colgate game, quarterback Jules Licata completed passes seemingly at will. (see “Bulls Roll To 5th Straight Win, 48 to 19” Buffalo Courier-Express, 31 October 1948) The only other disappointment of the season was a tie against hated rival Niagara University in a muddy Civic Stadium in week 7. But overall, Frank Clair lived up to the hype as the Bulls finished the 1948 season 6-1-1 with spirits high for continued success. “Red Raiders Trample UB By 25 to 0” Buffalo Courier-Express Buffalo, NY, 26 September 1948. “UB Turns in 39-0 Win Over Hobart” Buffalo Courier-Express Buffalo, NY, 3 October 1948. “U. B. Registers Handy 31-19 Win Over RPI” Buffalo Courier-Express Buffalo, NY, 10 October 1948. “Buffalo Subdues Alfred in Rain” Buffalo Courier-Express Buffalo, NY, 17 October 1948. “UB Smothers W&J Under 41-14 Count” Buffalo Courier-Express Buffalo, NY, 24 October 1948. “Bulls Roll To 5th Straight Win, 48 to 19” Buffalo Courier-Express Buffalo, NY, 31 October 1948. “Niagara Rallies to Tie UB, 13-13” Buffalo Courier-Express Buffalo, NY, 7 November 1948. 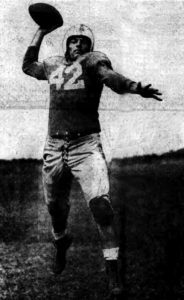 “Cleri, Price Set Pace as UB Gridders Close With 47-13 Victory Over Bucknell” Buffalo Courier-Express Buffalo, NY, 14 November 1948. Louisville, Ky., Oct. 30 — Buffalo’s Bulls completely wrecked the University of Louisville’s homecoming by romping over the Cardinals, 48-19, before 10,000 persons tonight. It was UB’s fifth straight win. Led by the line smashes of Ed Mittelsteadt, and the passing accuracy of Jules Licata, the visiting Bulls jumped into a 7-0 lead and were never headed. However, the Cardinals threatened to make a ball game of it when they roared right back to score and make the score 7-6, but the determined, ever-alert Bulls had no intention of letting a thing like that happen as they went on to pile up a one-sided triumph. The Bulls started the fireworks early, driving to the Louisville 15 in the opening minutes, only to be halted. However, after Louisville punted out they drove right back to score, tallying on a 54-yard pass play from Licata to Vic Cleri. Felix Seizega added his first of six extra points for the night. There was no more scoring until shortly after the start of the second period when Louisville’s Den Shelton ended a 77-yard Cardinal drive by scoring from the one-yard line. George Bertram’s try missed. The Bulls retaliated immediately for two quick touchdowns to take a 21-6 lead at half-time. Cleri circled end for five yards after the Bulls drove from their 20, and then Olson intercepted a pass by Louisville’s Frank Gitschier and waltzed over. The Bulls had a field day during the third quarter, during which they scored three touchdowns, counting practically every time they got their hands on the ball. Mittlesteadt, whose powerful plunges wrecked the center of Louisville line, plunged over from the Cardinal one after a Bull drive for the first third period counter. Then Licata flipped two strikes to Ray Wodarczak, one for 34 yards and the other for 35. for the other two to give the visitors a 41-6 lead at the period’s end. After Buffalo piled up that commanding lead, it relaxed and was outscored 13-7 in the final period. The Cardinals drove to the Bulls’ 3, and Gitschier flipped to Jim Haller for the second Card touchdown. After the next kickoff, the Bulls’ reserve backs went into action, led by fleet Howie Haderer, who traversed the final 24 yards to account for the Bulls’ last score. Except for a high pass from center, the Bulls’ Felix Siezega might have had a perfect night with his conversion attempts. He missed only one. Louisville’s last touchdown came when John Brewer bulled over center for 24 yards. The story of the high-scoring encounter is not told in the statistics, where rushing and first downs were almost even, but by the effectiveness of Licata to connect with a fling nearly any time he needed it.